In the collection held by the Mount Horeb Historical Society in Wisconsin there is an old stepback cupboard. Made of pine and painted red, the item dates to the late 1860s or early 1870s. Its straight lines and glazed upper doors related to the style of cupboards typical in America at that time. However, the curved wings that flank the step on each side point toward Norwegian stylistic influence. The raised diamond panels of the lower casement doors indicate the cabinet to be the work of local craftsman Aslak Lie. The work of Aslak Lie, a 19th century Norwegian cabinetmaker who immigrated to Wisconsin, can be assessed both in light of style and construction. Spanning six decades, Lie’s career straddled the Atlantic Ocean, offering a case study in the influences of immigration on the creative output of an individual artisan. A 50-year old man when he emigrated, Lie came to Wisconsin an already mature craftsman. Tracing the corpus of his work through Norway and Wisconsin reveals the complex interplay of personal artistic style and changing expression. Aslak Lie was born in 1798 to husmenn, tenant farmer, parents in Reinli, Vladres, Norway. Reinli is a village within the municipality of Sør-Aurdal. Valdres is a mountainous, inland region in south-central Norway, situated halfway between Oslo and Bergen and oriented along the Begna River valley. Even as the Coalition Wars brought tough economic conditions to Norway, Lie’s family was particularly poor. The plot of land they farmed was situated on a northwestward-facing slope, which received less sun and retained snow for a month longer than southeastward-facing farms across the valley. The fifth child and fatherless at the age of twelve, perhaps Aslak Lie’s only advantage was that he possessed some schooling. With no public schools in Norway at that time, Lie received only a modest education from itinerant schoolteachers and confirmation classes. Still, he learned well enough to read and write. Aslak Lie enrolled in the Aurdal Company of the Valdres Musketeer Corps on November first, 1819. Twenty-one years old, Lie was given the rank of corporal, a non-commissioned officer whose duty included keeping the company’s records and maintaining equipment. The job required service for only a few days of the year and paid just a small stipend, but the post conferred upon Lie some degree of respectability and provided him with a rare means of upward social mobility. Moreover, with nearly no evidence as to how Lie acquired his skills as a craftsman, military training, or connections he made through his service, are possible avenues through which he learned. An inscription he made on the stock of a hand plane places Lie in Christiana on August fifth of the following year. When signing his name on the plane, Lie included his rank in the military. The plane suggests that he was in the city learning the cabinetry trade and assembling his own set of tools, but there are no records indicating how long he was in the city. The quality of the decorative floral carving on the plane indicates that he had at least become practiced by the time he made it in August. The impact that Christiana’s urban fashions had on his work for the rest of his life also suggests that Lie spent a considerable amount of time there, absorbing the principles of what was considered to be good design. It was also perhaps here that he started to develop his ideas of artistry and artistic identity. However long Aslak Lie spent in Christiana, he was back in Sør-Aurdal by 1824 and beginning his career as an artisan. Beginning in that, year he aided in the construction of a belltower for the village church in Bagn, on which project he also demonstrated that he knew ironworking. That year Lie was also hired to build four drop-front desks, each of which he signed on the bottom side of a drawer. Signing his work made Lie unique as a furniture-maker in Valdres at this time. By signing the pieces he made, often accompanied by the date, his title as corporal, and, in some instances, a note, Lie seems to have been trying to advertise his skills and gain notoriety. Over the course of his career, Lie’s use of his signature changed. Early on, he signed most pieces he worked on, but as he matured and innovating with his own designs, his signature appeared only on those works that he seems to have felt he exercised his creativity. Lie’s self-conscious use of his signature appears to belie an aspiration to be recognized as an artist and achieve a higher social standing. In 1826, Lie took two major steps in his life. The first was signing a contract to become a husmann. On January fourth, Lie entered into a lease for a small tract of uncultivated land adjoining the Sondre Lie farm. In exchange for use of the land, Aslak Olsen Lie was required to work for the owner of the property, Ole Olsen Brenden, for several weeks a year and pay him a number of bushels of produce. Lie built a cottage on the sight, put the land to plow, and called the site “Nerli.”  Then on June 16th, he got married to Marit Knutsdatter Døven. Eight years his junior, Marit was the daughter of one of the wealthiest farm owners in Valdres. However, the Døven family had nearly twenty children and Marit was one of the youngest of them. Consequently the dowry she brought to the marriage was relatively modest compared to the size of her family’s farm, but her status brought with her connections to future clients of Aslak’s furniture. The family spent ten years at Nerli, during which time Aslak Lie continued to receive a variety of commissions. He was employed by the Bagn church and its parishioners several more times, improving its balcony and adding decorative carvings to the organ and interior. He also continued to innovate, coming up with new ways to use and modify traditional Norwegian folk motifs. He made frequent use of elaborate acanthus and floral carvings, which, while out of style in the urban areas, were still popular among rural communities in Norway. His secretaries usually bear a signature design on the front of the drop-leaf. Comprising of two, highly stylized, carved rosettes, Lie seems to have taken inspiration from a rococo, 8-shaped pattern common on cupboards in the Vladres region. Lie’s design proved popular and he made a number of secretaries with variations on this design during his career in Norway. However, by the middle of the 1830s, he seems to have started feeling confined by the demand for the pattern. This is evidenced by the decline in frequency with which he signed these pieces. In works he made for himself, Lie’s work exhibits experimentation with different designs and motifs and particularly a growing interest in diamonds, or lozenges. In 1836, the Lie family saved up enough money that they bought their own piece of land on the more affluent side of the Begna valley. The property, called “Motet,” was situated near the main road between Bergen and Christiana and had a site for a mill. Three children were born to Aslak and Merit while they lived at Nerli, two of whom survived. At Motet, they welcomed four more children, all of whom lived into adulthood. In 1837, Aslak built a large, new house on his new property. This house was a major departure from the typical homes in Valdres at the time. Rather than building it according to a rectangular floor-plan, Aslak Lie added an ell to the footprint. The exterior gallery, rather than extending to cover the whole façade of the house, only spanned a part of it. Lie’s interest in diamonds in pervasive in the building; he rotated the square, gable windows onto their points, installed a diamond-shaped plaque with a blessing above the door, and added a diamond and rectangle wooden pattern to the ceiling of the parlor. In the large, center diamond of this pattern, Lie put up an iron plate with a hook, from which to hand a lamp. However, magnificent as this house and property was, the family seems to have faced difficulties. According to tradition, the Lie family faced such a shortage of food at one point that Aslak dismantled and sold the lock to the house for food. Emigration of people from Valdres to the United States started in the early 1840s. Norway’s growing population, coupled with a weak domestic economy, fueled the mass migration of people out of Norway. Letters, articles, and other testimonies from Norwegians who had gone to the United States circulated back within Norway, tempting others with the allure of economic prosperity and social advancement. Two men, Gul Guttormsen Ildjernstadhaugen and Stephen Olsen Kubakke immigrated from Valdres to Wisconsin in 1843 and 1846, respectively. Kubakke returned to Valdres two years later and set up a party for settlement. At the same time, an article by Thore Spaanem, published in the Norwegian newspaper Nordlyset, convinced Aslak Olsen Lie to emigrate himself. Lie set out with forty other members of the Valdres community to establish a new settlement in Wisconsin. The party set out from Bergen aboard the barque Augusta, arriving in New York Harbor on June 29th, 1848. Lie turned fifty while aboard the Augusta, accompanied by his wife, Marit, and all six of their children: Ingrid (21), Marit Oline (17), Ole (13), Knut (11), Halvor (6), and Ole (3). Also in the group were Aslak’s childless brother and sister-in-law, Ole Olsen Lie and Anne Olsdatter, as well as both Ingrid and Marit Oline’s future husbands. From New York, the party proceeded to Milwaukee, and finally to the Blue Mounds region of southern Wisconsin. Here the group settled in the township of Springdale, within Dane County. This original group, with Lie at its center, established the foundation upon which a successive chain of immigration of Norwegians from the Valdres region to the Blue Mounds was based. Here, as in Norway, Lie pursued his cabinetry with the goal of achieving greater artistic expression and economic security. The stepback cupboard in the Mount Horeb Historical Society’s collection was passed down through the Skindrud-Thompson family. The cupboard is one of a number of Lie pieces that the family owned. Many of these other pieces are also in the Historical Society’s possession and include a secretary, drop-leaf table, another cupboard, and an Empire-style sofa. Lie originally made the secretary for his eldest son, Ole. Lie often gave pieces like this as wedding presents, as he did with his other sons, Halvor, for whom he made a parquet secretary, and Knut, whom he gave a corner cupboard with a rounded front. Based on this, it is probable that Aslak Lie made this secretary as a wedding gift to Ole and his bride, Dordei Guttenborg, which would place the date of the object to 1855. Less than a year into their marriage, however, Ole died of disease, though not before the couple conceived a son. Dordei remarried in 1858 to Eric Skinrud. Lie likely produced the other aforementioned pieces for Dordei and Eric. From them, the furniture passed to a daughter, who married into the Thompson family, which is how the pieces ended up in the Thompson farmhouse, where they were when the Mount Horeb Historical Society acquired them. According to the descendants who owned the pieces, the stepback cupboard was jointly built by Aslak Olsen Lie and Eric Skinrud. However, there are no other works attributed to Skinrud, nor is there any indication that he was otherwise engaged in cabinetmaking. Without other known works to compare the cupboard to, it is very difficult to say for certain whether he did have a hand in making it. The only induction that two people may have been involved in making the piece is that the back boards are joined using two different methods. One of the joints fits together in a tongue and groove. The other joint is a half lap. The existence of two types of joints like this does not prove that two people worked on the piece, but it implies it suggests that there may be something to the family’s story. There is an alternative explanation for the story as well, which is that Eric Skinrud repaired the cupboard and this was misremembered in his family as him having been involved with building it originally. Support for this possibility is that the back does show signs suggestive of repair. There are three boards that are awkwardly placed, extending only part way up the cupboard and cutting across part of another board. These pieces are narrower, lighter, and have a smoother surface than the other boards that make up the back. These traits generally imply that a piece of wood is not as old as the rest of the piece. Of course, it is also possible that Skinrud both helped Lie make the cupboard and later repaired it. In any case, however, all aspects of the cupboard point to Aslak Lie having been primarily responsible for its form and construction. With a career that lasted roughly sixty years, Aslak Olsen Lie produced a sizable body of works over the course of his lifetime. Because he spent roughly thirty years of that career on either side of the Atlantic, comparing Lie’s works from Norway and Wisconsin illustrates how his style was changed and transformed as part of the process of acculturating to American society. Looking at a selection of the furniture Lie made in America reveals that his works fall on a spectrum of Norwegian and American styles. Rather than progressing according to a linear timeline on which his output becomes more and more American, Lie moved between styles regularly depending upon what the circumstances called for. A cupboard Aslak Lie made for John and Birthe Engesæthe in 1870 is a prime example of one of his Norwegian pieces. The cupboard is a typical form found in Norway with agled corners on the base, similar to a trapezoid, and a deep hutch and a rectangular top. Though formalistically similar to the cupboards he made earlier while in Valdres, Lie brought the form into a more updated style with a flat top and decoration with dominant use of straight lines. The drawers are red with painted versions of his signature diamond pattern. Still, within the rectangular fields in the cupboard doors, Lie has decorated the piece with rose painting. Lie’s dominant red and blue paint also speak to traditional Norwegian norms. In contrast, a chest of drawers Lie made sometime after 1878 illustrates his ability to work in an American mode. The turned feet and corner posts, double drawers on the top row, as well as the proportions, speak to the Sheraton influence on the piece. Meanwhile, the alternating bands of reeding on the corner pillars, saw-tooth frieze, and curved handles are all elements Lie has drawn from the Egyptian Revival. Made primarily of walnut, the color of the wood itself is meant to serve as decoration. This is something Lie rarely did with his Norwegian pieces, but is common in American furniture. Within this piece, Lie’s personal voice remains present, demonstrated by the large raised diamonds on either side of the piece as well as his use of secret compartments. Living within a mixed Norwegian and American community, Lie cultivated the ability to alternate between styles as a means of appealing to consumers’ tastes. In an advertisement Lie put out in a local newspaper in 1870, he promoted himself on his ability to make furniture in both American and European fashions. In this flexibility, Aslak Lie displayed what might be termed artistic code switching wherein he was able to shift from one vocabulary to another depending on his situation. Just as rural tastes limited him in Valdres, the commercial considerations of what the Springdale community wanted shaped Lie’s work in America. Beyond the constraints of his customers’ ethnicity and tastes, Lie also found himself constrained economically by what his customers could afford. Where Lie had hoped his customers in America would have allowed him to innovate on luxury pieces, he more often found himself making simple, unadorned furniture. Another process was happening in Lie’s work between these two styles – the synthesizing of the two influences to create a distinctly Norwegian-American style of furniture. The majority of Lie’s work in Wisconsin shows some degree of this hybridization. Here, too, Lie may have been responding to the gradual acculturation of Springdale’s Norwegian immigrants into American society. However, the presence of this hybridization in pieces Lie made for his own family, as well as other evidence of Lies sense of American identity, suggest a personal transformation was taking place. The stepback cupboard that Lie made for the Skindrud family is one example of this both societal and personal transformation. 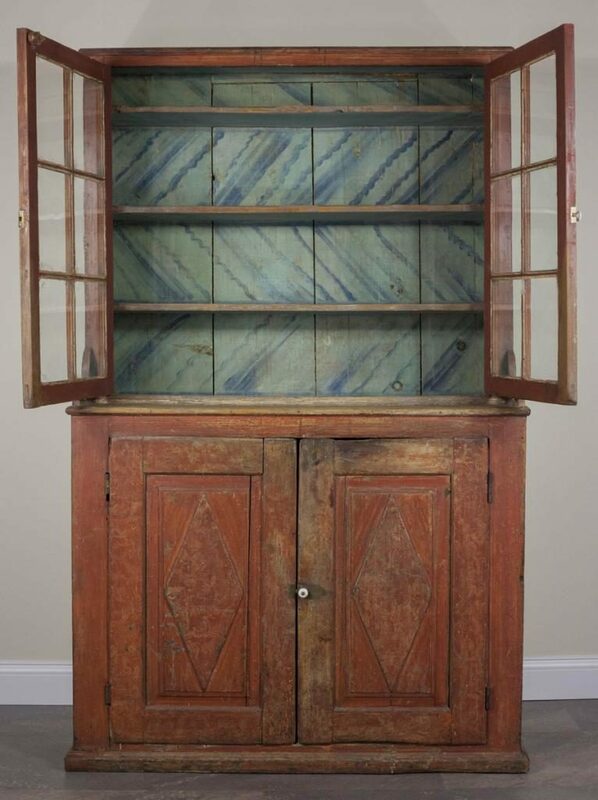 The overall form of the Mount Horeb stepback cupboard is American in character. At 75 inches tall, the stepback at the waist is thirty-seven inches off the ground. The lower portion of the case is nineteen and a half inches deep, while the upper portion is eleven and three-eighths inches deep. The entire cupboard is forty-five and three-fourths inches wide. The bottom of the cupboard opens with two frame and panel doors. The twin doors of the upper casement, on the other hand, are glazed, each one comprised of six square panes divided into two columns and three rows. Simple bands of moulding with both edges rounded run around the top and waist of the piece. A wider compound moulding runs about the base. The doors of the bottom panels include Lie’s signature diamond pattern, an ornamentation that bridges American and Norwegian styles. The stepback cupboard is a common American form. They appear in America in the 17th century and remained common up into the 20th century. The glazed upper doors originated in the 18th century as a way for the well-to-do to display their china. The proportions of the Mount Horeb stepback cupboard reflect common American conventions with the waist at or below half the total height of the cupboard. The rectangular base is also American and counterpoised with both the angular bases of the Engesæthe cupboard as well as other cupboards Lie made in Norway. While cupboards with deeper lower casements and shallower upper casements are found in Norwegian design, those examples differ from the Mount Horeb stepback. On the Engesæthe and Valdres cupboards Lie made, the base juts out by virtue of the angled sides. Likewise in examples in that style, a hutch separating the lower and upper cabinets is ubiquitous. Because of the inward angle of the base, frequently the lower cabinet has a single, panel door. Norwegian cupboard also often have drawers between the lower cabinet and hutch. Though the casework conforms to American sensibilities, Lie ornamented the cupboard with a number of Norwegian elements. The curved wings on either side of the stepped shelf harken to elements found in traditional Norwegian cupboards. The S-shaped slope and bump-shape of the wings of the stepback cupboard is nearly the same progression of curves that frame the sides of the hutch on the Engesæthe cupboard. To accommodate the wings, Lie diverged from the construction of an American stepback where the sides are composed of two boards; one the width of the top cupboard extending the entire height of the piece, and the other running from the base to the step only as wide as the base comes forward. Lie widened the taller side piece so he could cut out the wing and enclose part of the step. That is to say, the shorter board is narrower and emerges above the step to form the bump in the wing. Lie also eschews the use of feet as is common on American stepback cupboards. Instead the base rests wholly on the floor, as is the norm for Norwegian cupboards. Likewise, the original color scheme for the Mount Horeb cupboard was red outside while the interiors and top of the step are painted blue. This, again, appeals more to Norwegian tastes than to American. While Wisconsin afforded Lie fewer opportunities for extravagant artisanship than he had hoped, he was nevertheless able to experiment and push boundaries in new ways. The process of stylistic hybridization was itself a creative action. Lie created new designs out of elements he knew from both Norway and America. He was still able to show creative self-expression through his cabinetry. While not as elaborate or fine as the secretaries Lie made in Valdres, the Mount Horeb stepback cupboard is an example of individual artistic growth. Lie took joy in interpreting his customers’ and his relations’ tastes and ethnic identities to determine what balance of influence he should use in specific pieces. In form and style, Aslak Olsen Lie’s post-immigration works display a great variation as he actively interpreted his neighbors’ and his own ethnic identity. At a more structured level, however, Lie’s furniture retained a more consistently Norwegian character. The techniques and habits that Aslak Lie pick up as a young man in Norway stayed with him for his entire life and were present in his pieces regardless of style. Lie’s dovetails are illustrative of both the Norwegian tradition he worked in as well as his own unique idiosyncrasies. Lie made his pins and tails to be roughly equal in size. He tended to cut the two at a roughly twenty degree angle. However, on smaller drawers, such as those that made up the insides of drop-leaf desks, Lie would cut one side of a tail at an angle, while the other he cut straight. What distinguished his dovetails was his use of wedges. After fitting pins and tails, Lie would take a chisel and knock two notches in the end grain of the pins. He made each of these notches at an angle parallel to the side of the pin it was nearest to. Then he hammered a small wedge into the notches, firming the faces of the pins up to the tails and making the joint fast. Incredibly, Lie used this technique even on half-blind dovetails. The technique of using wedges to fasten dovetails instead of glue is found in cabinetry traditions of Germany and Norway, and thus shows up in some American furniture from Pennsylvania and Wisconsin. However, it is alien to the Anglo-American craftsman. Most craftsmen using this method only use a single wedge in each pin. Lie’s double wedges at angle were an artistic flair all his own. Lie used this technique regularly; it can be found on the carcass of the Mount Horeb stepback cupboard and drawers of the secretary he made for his son, Ole. Significantly, it even shows up on the late-career, Egyptian Revival chest of drawers. Through training and practice, the techniques that an artisan such as lie used became habit. As they worked, they would follow the steps that come naturally to them through muscle memory. Thus, even while the immigrant Lie used his head to innovate and alternate styles, his body followed the same, distinctly Norwegian, patterns of work that he had done for decades. This, too, then was an expression of ethnic identity and one that remained largely unchanged even as other parts of Lie’s work became Americanized. Consideration of the life and work of Aslak Lie shows that on an aesthetic level he actively shapes his identity as a Norwegian-American craftsman, but in his techniques he retains his Norwegian identity. As a case study, Aslak Lie demonstrates how the process of acculturation and hybridization among first generation immigrants is an active process. Lie’s consciously shaped and used ethnic character to navigate his new market. By so doing, he pushed his own artistic boundaries, as well as both Norwegian and American furniture to new forms. Simultaneously, Lie’s retention of his native construction traditions shows ethnicity to work on many levels, not all of which are equally subject to change in a new environment. Habitualized practices, such as those that make up the individual actions involved in making, are deeply in-grained within the individual. Lie is one example of the immigrant experience. Immigration is ripe for analysis with a Material Culture approach because it reflects ethnic identity of the maker. Considering the work of someone like Lie is a way of understanding how he navigated the immigrant experience in 19th century rural America. Going forward, the example of Lie’s retention of culturally-bound techniques raises questions about the ability of such practices to be transmitted and continued by successive generations within immigrant communities. Whether they survive, mutate, or disappear is a question about the long-term durability of distinct ethnic identity. Their study also can inform how new practices are introduced, disseminated, and assimilated by the dominant culture. Ultimately, work identifying and tracking individual Norwegian artisans such as Aslak Lie is only in its infancy. Further investigation is required to determine whether the example of Aslak Lie is typical of the immigrant artisan or whether his own artistic attitudes and circumstances make him unique. In any case, the quality and character of Lie’s production warrant study and analysis in their own right. Creators, Collectors & Communities by by Peter Thurlow is licensed under a Creative Commons Attribution 4.0 International License, except where otherwise noted.